I don’t normally write about personal things. 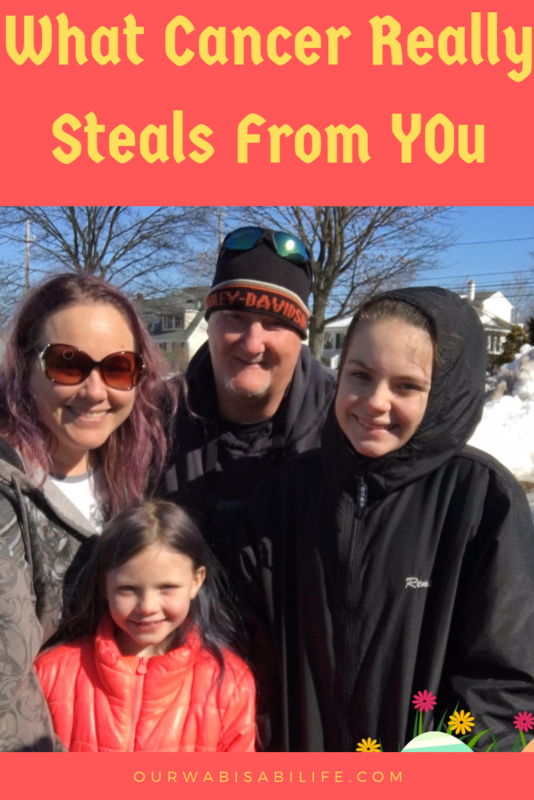 I will share a story here and there about the kids, as it fits into a recipe or craft, or family fun that we are doing, but overall, these are brief glimpses into the happy things in our lives. I have shared a few times about my husband and the fact that he has stage 4 prostate cancer. But the other night, I got to thinking about the things cancer really steals from you. Let me start off by saying, my husband, who is only 53, is going to die. When he received his diagnoses in May 2015, while they gave us hope that he would have 7 years, there is no doubt that prostate cancer will kill him. While this is upsetting, it isn’t the worst part of cancer. See, I will lose my husband one way or another, someday. He is 11 years older than me, he has a family history of health problems, and he is a man, which means, in general, he will not live as long. Whatever, the reasoning, I always knew, within reason, that he would most likely die before me. So whether it is cancer or a heart attack, I will lose my husband at some time. With cancer, however, we have a constant clock ticking in our ears. That clock is part of the problem. When my husband, then boyfriend, got the news from the first doctor, the one who did the biopsies, he gave him 17 months. 17 months without treatment. At the time, he didn’t have insurance. We had no idea how he would get treatment. And we were lost. We were lucky to find a doctor who would take him on, even without insurance. He was turned away by 3 doctors. They would see him for $50 a visit while we figured out the insurance mess. They got him 3 months of free hormone shots, which he needs to keep cancer from growing. And she told him, with treatment, we could expect, hopefully, 7 years. So every day, pretty much every minute, we hear that tick. The ticking of the clock for the amount of time we might have. Tick, Tick, Tick. This clock is there, even on the best day, the best times. It was there at Christmas. Reminding us we only have so many Christmas together. It was there at the birth of our grandson. Will he get to see the other kids have babies? It was there the day we got married. How many anniversaries will we get? It’s there when we try to sleep. It is that voice in the middle of the night, reminding him that eventually, his life will come to an end. The voice that reminds me that there will be a time when I am sleeping in our bed alone. Don was always one of the most amazing people I have known. While we have only been together as a couple for 3.5 years, I have known him my whole life. He was friends with my brothers while I was growing up. As an adult, I watched him deal with an awful marriage. I watched him love his ex-wife’s children as his own and I watched him be an amazing father to his children. As his ex-wife broke his heart, I watched him and watched him raise his kids alone. I watched him help anyone and everyone who needed him. I watched him work 16 -18 hours a day and still have time for his friends. I watched him go camping, hike mountains, and work on cars. I watched him and thought he was an amazing person. When my marriage ended, he was there when I needed someone. It never surprised me that I fell in love with him. And I fell hard. 2 weeks after we became a couple officially, he got the news. At 49, he had stage 4 prostate cancer. He was told 17 months. He was told 7 years. He was told he needed treatment. I watched the man who couldn’t be stopped, be stopped. He couldn’t work. He needed chemo, which wrecked his body. I watched the man who was fun and vibrant and always there, becomes depressed, tired and angry. Don is angry. He is angry all the time. It manifests as being a grumpy old man. In the past 4 years, I have seen him become easily annoyed. Between being in pain and the medicine that is keeping him alive, he is hormonal and cranky. He feels like a woman with PMS. The medicine he takes away his testosterone, and that messes with his body. He gets hot flashes, he suffers from memory loss and he is crabby. He has trouble with his memory, which makes him irritated. Because he is depressed, he gets pissy. Things that never would have bothered him, bothers him deeply. His fuse is short. He has trouble enjoying the things he used to. When Don was diagnosed, he worked in construction. He already had a beat up body. His knees and shoulders would hurt all the time. His back ached. However, he had no idea what pain was until cancer took over his body. Don received chemo three months after his diagnoses. The doctors tell us it could add 18 months to his life. We were desperate. He received 6 rounds of Taxotere. He would go in for an infusion every 3 weeks. They would pump his body full of poison. He lost his hair. Don lost the feeling in his fingers and toes. He developed widespread pain through his entire body and now, he gets headaches. His body hurts so bad he cries, and he can barely walk. Every dr told us he would feel better when chemo was over. After he had a chance to get it from his system. Now they say it won’t go away. If it was going to it would have. Don struggles to walk. He struggles to do repairs on the car. He struggles to hang drywall. Everyday household tasks, like washing dishes, can leave him in pain where he needs to sit for an hour. The man who used to hike mountains needs a handicap sign on the car because walking into the store and around the store can be too much for him. The one who walked 6 miles with me on a trail because we didn’t pay attention to how far we walked, has trouble walking to the end of the driveway. The same man who remodeled an entire house, over and over again, can barely fix a leaky sink because it hurts too much. The man who climbed boulder fields has trouble walking on uneven ground. Yes, cancer steals your life. It takes the people we love, and they are gone. We don’t get them back. But, it can take the people we love away from us way before they die. For us, cancer has stolen who Don was. It took away the easy going man, who loved to always be on the go. Cancer took the patient father who would play for hours on end. It took the energetic man who could not sit still. It took the usually happy man and turned him into someone who is short tempered. Now, I painted a picture of a miserable person who is awful to be around. That isn’t the case. He is still a loving husband and a terrific father. My girls are lucky to have him. He still puts us first. Don tries to be the person he was. He is kind and caring and he is amazing. I am in awe that he handles it all as well as he does. He is the love of my life and I have never regretted my decision to stay with him after he was diagnosed. I never will. He just isn’t who he used to be. But this is What Cancer Really Steals From You. It is so much more than just losing a life.